I am so grateful we still have the right to homeschool in every state in America (and in other countries like Canada and Australia). Although we can freely homeschool, there are some parameters we need to adhere to that vary from state to state or country to country for that matter. No matter what state or country in which you live, an amazing tool to capture your child’s education is a homeschool portfolio. 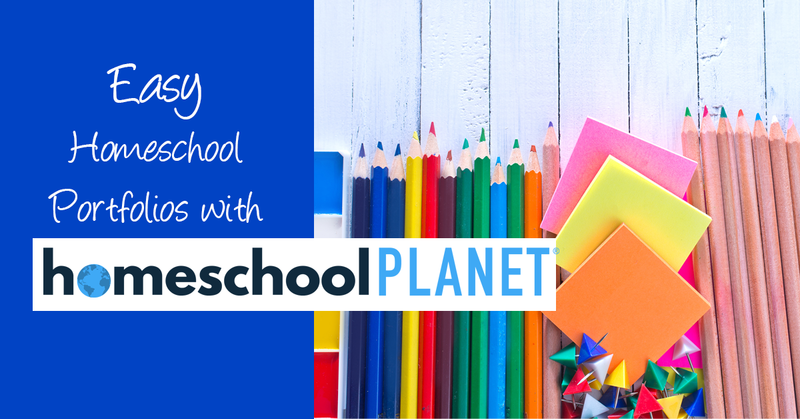 You can easily create an all-encompassing homeschool portfolio for each of your children with Homeschool Planet’s digital homeschool planner online. If you are in the U.S., each state has developed its own legal structure for home education. One state’s homeschooling requirements and laws may look completely different from another. It would be beneficial for you to take a glance over at the Home School Legal Defense Association (HSLDA) website for insight and laws for each state. Some states don’t even have reporting requirements which is amazing! Yet it leaves you with a decision of whether to keep a homeschool portfolio or not. If you ask most veteran homeschoolers, they would tell you that keeping stacks of documents and physical files containing your child’s work over the years is just not efficient. It is, however, wise to keep a digital homeschool portfolio of your child’s work in the event you ever need proof of progress — for whatever reason. Even some youth sports teams require a record of progress to be allowed to play or participate. What do you do, as a homeschool family, if you have nothing to show in regards to your child’s academic progress? It isn’t hard to do, but Homeschool Planet makes it even easier. Whether your state has strict reporting laws or doesn’t have any at all, Homeschool Planet provides an easy portfolio with everything you need in one place. Having to keep a record of all this can be truly overwhelming. Yet, Homeschool Planet has a means to gather all this information, all in one place, all throughout the year. Homeschool Planet has the power of the computer with the convenience of paper. Homeschool Planet is intrinsically designed to make homeschool organization and accountability easy, mobile, and flexible for the whole family. Homeschool Planet is a household organization and homeschool management tool that truly can fit any homeschool approach your family follows (i.e. Montessori, Charlotte Mason, strict curriculum based, etc.). Even if you take a more naturalistic or organic approach to homeschooling, keeping a homeschool portfolio through Homeschool Planet is a perfect way to log in all your children has learned to fulfill your state requirements no matter what your teaching style. Homeschool Planet has the ability to produce all the following criteria easily for a portfolio to use either for your own use of record management or to satisfy any state requirement record. Note: Transcripts are fully customizable with spots for activities, honors, and standardized test scores. Enter previous information for a complete picture and choose the scales and weights for your GPA. Group individual classes together for a single grade. For example group Spelling, Literature, and Grammar classes together for a single Language Arts grade. If your state requires you to have a portfolio evaluation, Homeschool Planet takes the fear completely out of that process. You can print all the documents you need right out of Homeschool Planet, should you need hard copies for your evaluation. The print-outs all fit nicely into a 3-ring binder, file box, or accordion folder. 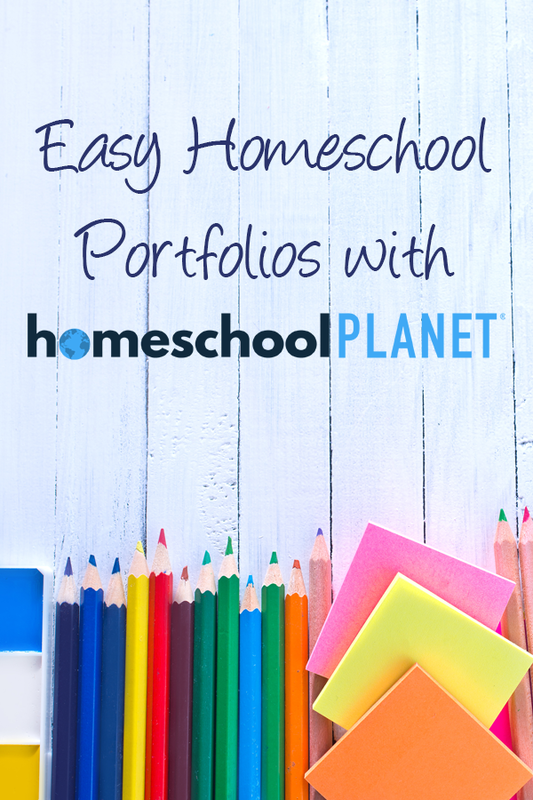 You truly do not have to worry about putting together a portfolio last minute, since Homeschool Planet keeps all you need in one place for you. Even if you need a portfolio right where you are in the homeschool year, it is no problem to have one readily available right in Homeschool Planet with just a few clicks. Some states give parents a form to fill out and submit. However, in many areas, portfolios are recommended and often even requested for college admission. Homeschool Planet’s online homeschool planner delivers all you need to easily make a homeschool portfolio for one or all of your children in no time at all.